After a day or two of using the iPad, my brain seemed to have rewired itself. It’s not that the iPad is better or worse than the Mac; it’s just that different things are hard to do on each device. The thing I found the hardest to get used to on the iPad was the lack of windows. On the Mac, I think nothing of arranging a Web browser and a text editor, or two text-editor windows, side by side and then referring to one while typing in the other. On the iPad, that’s impossible, as I found on the morning of day three when I tried to start composing this story from my notes. That third day also happened to coincide with the weekly staff videoconference meeting, conducted via Google+’s Hangout feature. Using the iPad for this was frustrating for a couple of reasons: First, the Google+ app doesn’t have a native iPad interface and must be used in the 2X mode. Second, there’s no way to click on the URL for a hangout and have it load the Google+ app; I had to have a colleague invite me through Google+ itself. After the meeting, I spent some time proofreading the PDFs of an ebook Macworld is preparing. While Mac OS X has Preview, iOS has no PDF reading capabilities built in (unless you’re viewing a PDF in Safari or Mail). So I turned to one of my favorite apps, Good.iWare’s $5 GoodReader ( ); not only can it handle PDFs with aplomb, but it downloaded the file from a URL and unzipped it. However, the couple of hours I spent proofing those chapters adversely affected my iPad’s battery life. For the first two days of my experiment, the battery held up spectacularly; by 5:00 each afternoon, it had dropped to about 18 percent of capacity. By the end of work on day three, however, it had dwindled to just a few percent, and I was forced to plug it in to finish up. That’s still better than my MacBook Air, which can run from full to no charge in an afternoon. 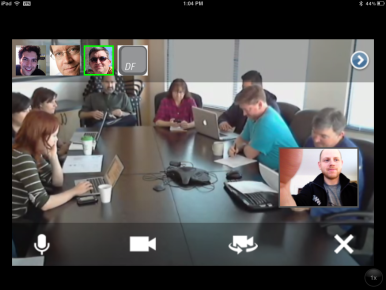 Trying to connect to a staff meeting via Google Hangout from the iPad proved to be a hassle. As I wrote my wrap-up column at the end of day three, I found myself thinking again about how well the iPad works with an external keyboard. Not only can you enter text, but you can use familiar keyboard shortcuts to do things like copying and pasting, undoing and redoing, and moving the cursor and selecting text. That last one in particular is a godsend. If you’ve spent any time trying to select text on an iPad, you’ve probably spent time wrestling with that magnifying glass interface. But savvy Mac keyboardists who are familiar with all the tricks of the Command, Option, Shift, and arrow keys will find themselves breezing along as if they were sitting in front of their computer. In the end, though, the iPad’s keyboard integration works just well enough to make you wish it worked better. There are a lot of places where you’d think shortcuts would work, but they don’t. For example, there’s no way to get back to the home screen or navigate between apps from the keyboard. And even with iOS 5’s addition of rich text in Mail, you can’t use the familiar keyboard shortcuts to apply bold, italics, or underlining to your text. And in some places, the iPad’s keyboard support is wildly inconsistent. For example, when autocompleting an email address, you can use the arrow keys to scroll through the list of suggestions and the Return key to select one. But try to do the same with a list of autocomplete URLs in Safari, and you get bubkes. Too often, you have to go back to the touchscreen. Spend a couple hours—or heck, 20 minutes—with an iPad, and you’ll see pretty quickly that the idea of a touchscreen Mac doesn’t make much sense. Having to constantly raise your hands from the keyboard to interact with the screen just feels wrong. It’s not simply the unfamiliarity of it: The effort of lifting your arm—instead of, say, shifting it sideways to a mouse or trackpad—is significant. And there’s that problem I ran into on day one, needing two hands to perform most on-screen gestures. This isn’t a slight to the iPad, though—its interface feels perfectly natural when you use it in your lap or hold it in your hands. It’s an issue of forcing an iPad-shaped peg into a Mac-shaped hole. 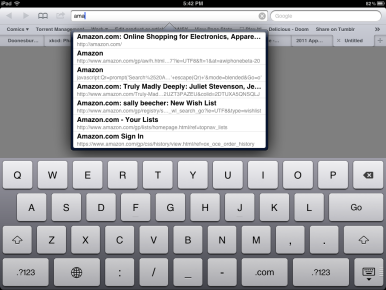 The iPad's inconsistent autocomplete behavior from app to app can be frustrating. Using the iPad as your primary machine forces you to adjust the way you think about and prioritize what you’re doing. For example, on the afternoon of that third day, I realized I had neglected the Campfire room for several hours. Unlike the Mac, the iPad gives you no way to keep an eye on a chat room window. None of the Campfire clients I tried had notifications, so if they weren’t running in the foreground, I had no way to know what was going on. That isn’t always a bad thing, though. For example, it made me concentrate on the tasks at hand, instead of being constantly distracted by Twitter, IM, or my RSS feed. But some tasks do occasionally get lost in the shuffle. By the end of my three-day experiment, I felt as though I’d gotten the hang of working on my iPad. I felt like cursing it only once, when Safari reloaded a tab in which I’d been writing, erasing all of my progress. And there were Mac things that I definitely hadn’t missed: the spinning beachball, for example. The iPad’s snappiness rivaled that of my MacBook Air, and I rarely felt as though I was waiting for it to catch up to me. I had a definite sense that this might be the future of working on a computer. I spent little if any time managing files or saving my data (just as in Mac OS X Lion). And thanks to Dropbox and iCloud, I didn’t worry at all about lost data. That’s perhaps the biggest change in switching from a Mac to the iPad: The technology becomes almost transparent. You are simply writing, or reading, or browsing. It’s all about the task itself, while the technology you’re using fades into the background. Dan Moren is senior associate editor for Macworld.